Ever checked out the Amazon list of most popular baby books? Those baby books sell like hotcakes. When people become parents they want to feel in charge, in control at a time they usually feel anything but. The commercial book world is totally on to that need. I don’t know about you but waking a sleeping baby, one that fell asleep without assistance is on my hell to the no list. When nature gives you the gift of a sleeping baby, take it. Don’t be waking those sleeping babies up and creating more work for yourself. And there’s no forgiveness around all night screaming fits or that you may have just got back to bed at six am. Rise and shine mamas, you wouldn’t want to get off schedule and miss your ten am scheduled stroll. It’s ok and pretty normal to want to feel in control at a time in your life where you might feel anything but. In my experience, which is echoed by that of my perinatal psychology colleagues, these books generally make mamas feel worse. They often stress parents out and make them feel like failures. That’s why we have created a list of baby books that you should just burn. A book that promises you a perfect baby or a sleep-through-the-night baby. A calm, settled baby does make life easier. The inconvenient truth is that babies are born with different temperaments and needs. As my wise child health nurse once commented to my moms group: “The problem is that your babies haven’t read the books” meaning your babies are just being babies. These books and their suggestions may work for some types of babies but they may even be harmful to those babies that need more holding and settling. They may get in the way of you building confidence as a parent if what the books suggest is unworkable for you and your baby. Books that promise you can program your baby. Some baby books suggest that babies are like robots that we can program them to be not like babies. Or worse, like puppies that we can train with rewards, ignoring and consequences. These books ignore the natural rhythms of baby humans, they ignore what babies need in order to provide new moms who may be feeling anxious with a method for feeling in control. They may work for some babies, but not all babies and not all PARENTS. Books that prey on your fears. The books on my to-burn list pray on your fear that as a new mama you don’t know what you’re doing, you’ll never sleep again or that you need an established routine to return to work by a certain time frame. Books that say your baby will be brain damaged or have ADHD if you RETURN TO WORK, have a routine or use sleep training are equally scare-mongering and usually rely on evidence based on severely neglected children in orphanage settings that are rarely held or responded to. There is a middle ground in parenting, but these books will never admit it. Nothing makes me sadder than to hear of a new mama FALLING APART WITH ANXIETY because she realises she can’t keep to the schedule. If a book recommends a strict schedule this will work for you and your baby AVOID. Not only are the routines suggested not consistent with the need to be flexible in life, it can make you anxious trying to follow something that feels unnatural. 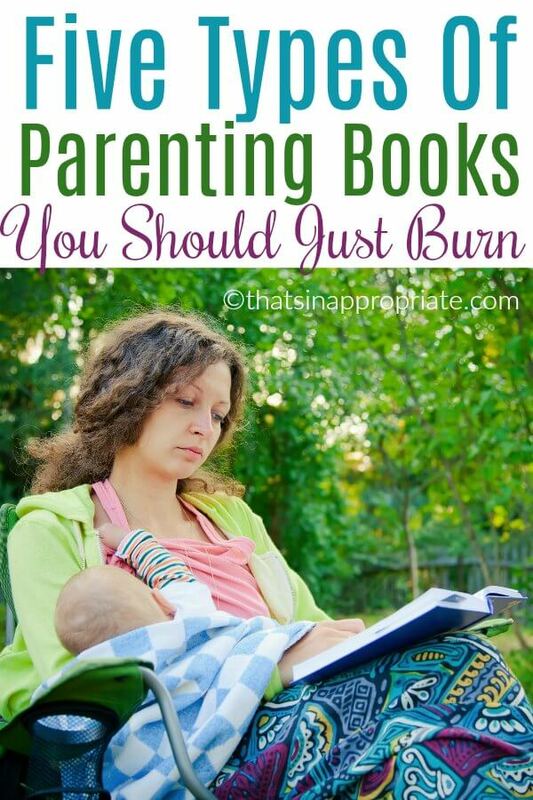 If you and your baby “fail” their program these burnable books put that failure on the mamas. According to the authors of these burnable books, their program works for all babies, so clearly moms whose babies still don’t sleep or remain fussy just needed to follow the program a little better. You are hard-wired to respond to your baby. If you want to hold that baby, hold that baby. If your body and mind is telling you to do so, follow that instinct. Before any books existed mamas were responding and nurturing their babies by following their gut and from the wisdom they had learned from other mothers. You have that instinct inside of you and its ok to use it. Any book that tells you to ignore it is burnable. The truth is there are many ways to parent that result in raising good humans. Parenting with nurturing love, kindness and commitment for the long haul can look really different. Parents in the same home sometimes need to parent two kids quite differently because they have DIFFERENT NEEDS. Any book that tells you otherwise, is definitely burnable. It’s ok to take your time to learn to be a mother. Trust that you will learn and grow with your baby. Know that there are no good or perfect babies, there are just babies and all of them are valuable little people whether they sleep through or not. It’s ok to not know what you’re doing some of the time. If you need advice and we all do from time to time, rather than following these mass produced manuals, get individualized help specific to your situation, advice that has you and your baby’s needs in mind. And if you own any of these types of books, you know what to do with them.